Bartholomew and the Oobleck (1949) Caldecott & Newbery Winners Announced! Horton Hears A Who; written and illustrated by Theodor Seuss Geisel (a.k.a. Dr. Seuss); Random House; 1954. There are three printings of the book with “250/250” price on the front DJ flap. 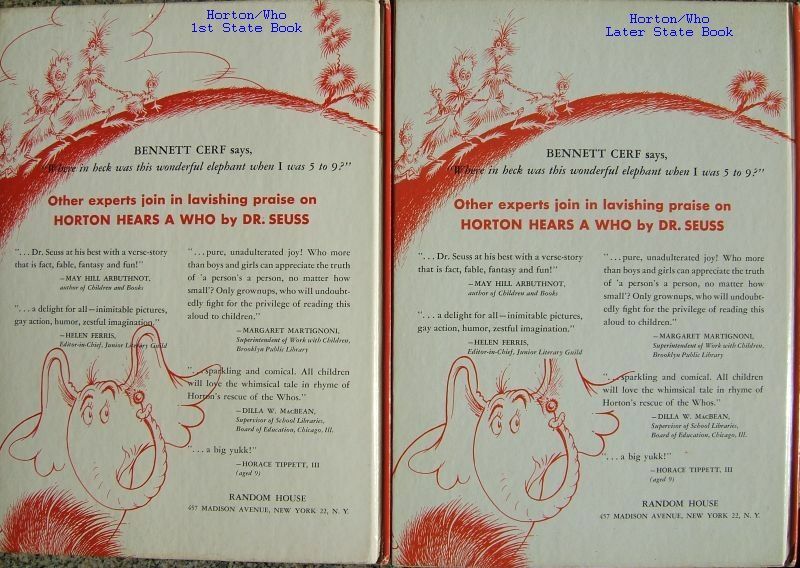 The first two printings have Horton’s “full ear” graphic on the back of the book and dust jacket. The third printing book’s back and back DJ have Horton’s partial ear (ear cut off by Junior Literary Guild review). Horton has full ear on back cover graphic, with cloud in upper left corner, and five branch tree in upper right corner. Later issues had Horton’s ear cut off by review, no cloud, and two branch tree. See photo. 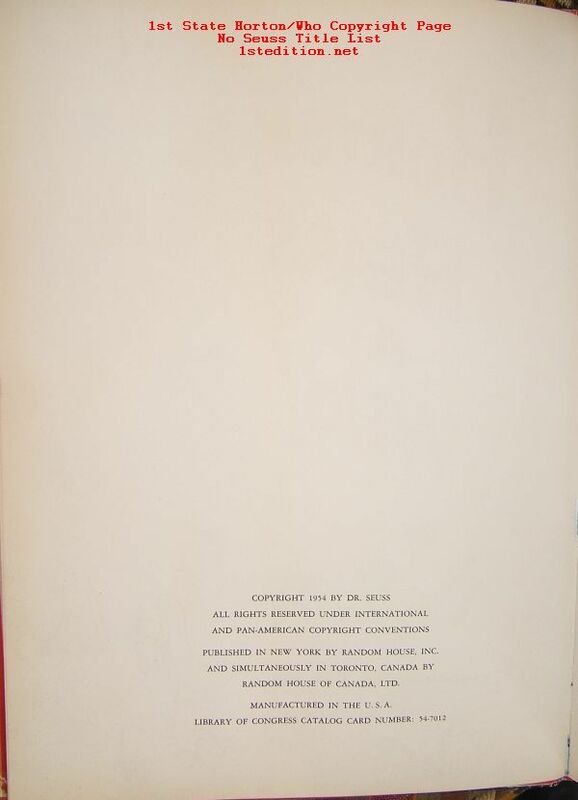 This later printing’s graphic (partial ear, no cloud, two branches) was used on the book and DJ post-1957, when the price of the book was changed to “295/295”. The book’s price was “250/250” from 1954-1957. The true first edition book’s copyright page does not have a list of “Other books by Dr. Seuss”. 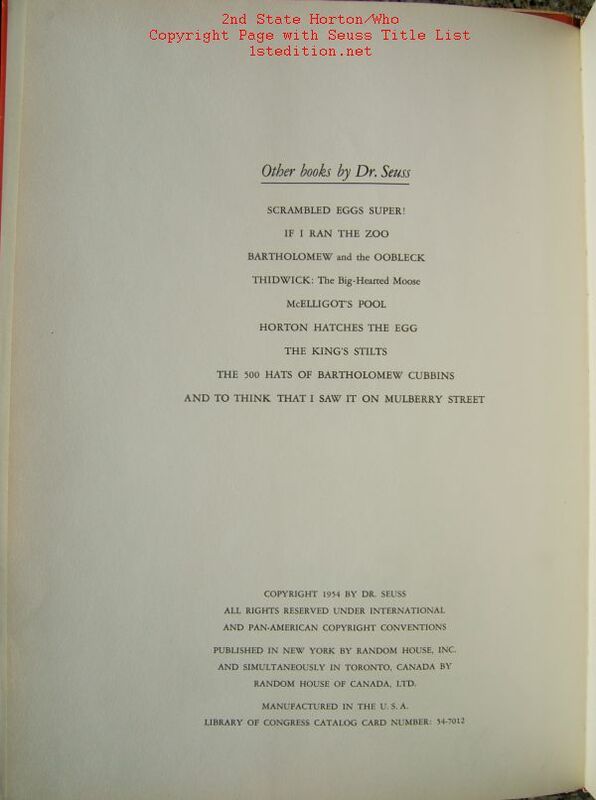 Also, on the true first edition book, the reverse of the rear endpaper has a list of nine books, titled “Other books by Dr. Seuss”, starting with SCRAMBLED EGGS SUPER, and ending with “AND TO THINK THAT I SAW IT ON MULBERRY STREET”. Younger/Hirsch identifies this first edition book as a ‘variant’. The following table is a compelling argument that it is not a variant, but instead the true first edition of the book. 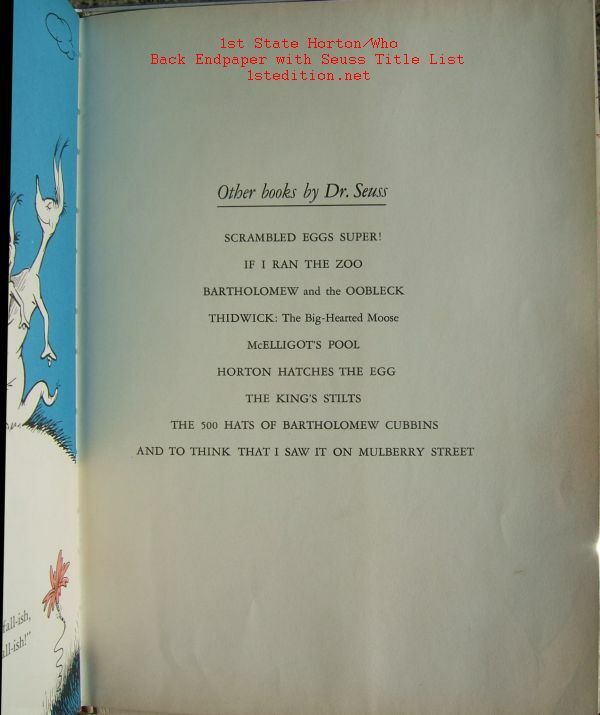 Note that all later printings have the Seuss title list on the copyright page. Only in the first edition book is there no Seuss title list on the copyright page, and instead, the list is on the back of the rear endpaper. Horton has full ear on back DJ graphic, with cloud in upper left corner, and five branch tree in upper right corner. 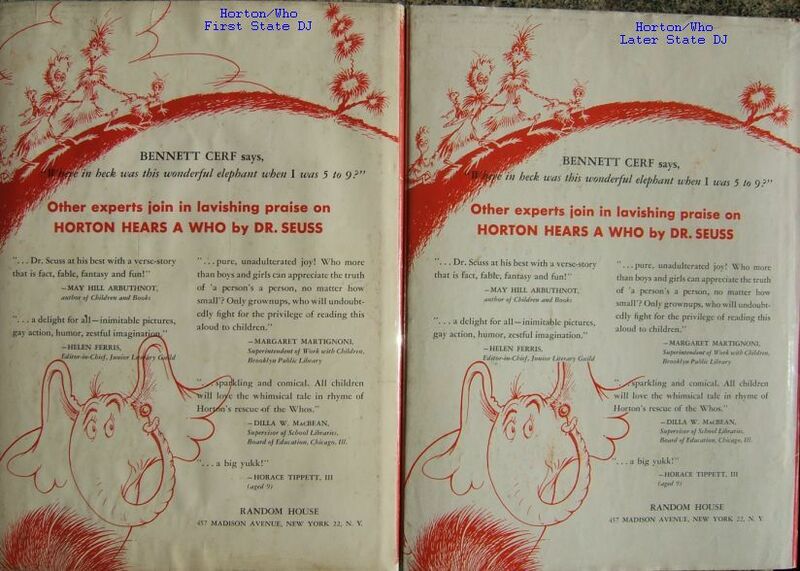 Later printings had Horton’s ear cut off by review, no cloud, and two branch tree. See photo. The dust jacket is the same on both the first and second printing books. The DJ price of ‘250/250’ is not necessary if the ‘full ear/clouds/5 branch’ graphic is present on the back of the dust jacket.